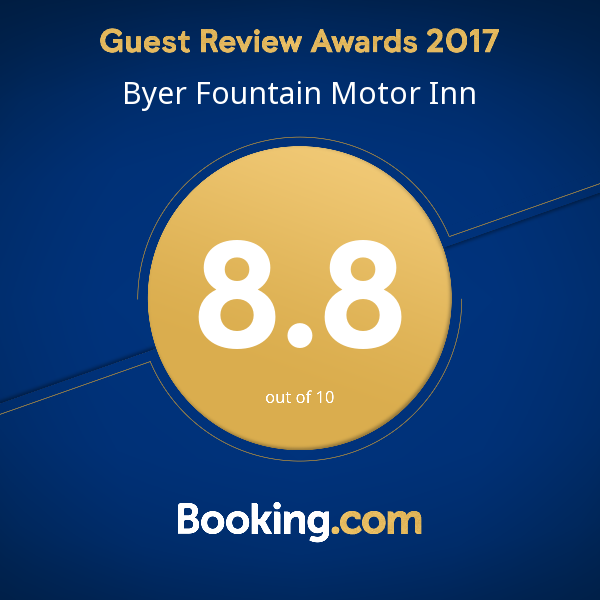 Popular Holbrook Motel, the Byer Fountain Motor Inn is located almost mid-way between Sydney and Melbourne just off the Hume Highway in the recently bypassed Submarine Town of Holbrook, NSW. This Holbrook motel has a combination of single, double and twin share ground floor accommodation making it a perfect rest stop for singles and families. All 36 rooms are ground floor and have reverse cycle air conditioning, tea and coffee making facilities, fridge, modern LCD TVs with Austar Cable, clock radio alarms, toasters, electric blankets and are now well away from highway traffic noise. Our fully licensed restaurant is open on weekdays (except Public Holidays) and specialises in simple ‘home cooked’ ’country style meals with vegetarian and gluten free options and can seat up to 50 guests. Continental breakfast is available at a surcharge and can be delivered to your room the night before. Our large grounds offer ample off highway parking for guest towing trailers or boats. It’s also a perfect overnight stop for even the largest coaches allowing guests and their luggage to be delivered right to their rooms. Starting at $30, we now offer Gift Vouchers with 2 months validity from the date of purchase. Perfect for any occasion, why not spoil your loved ones with a relaxing getaway at the motel or a scrumptious dining experience in our Restaurant or both. Simply call us on 02 6036 2077 and we can email you a Gift Voucher for your loved one to enjoy. What an amazing place, I normally stay at another place in Holbrook but it was booked out, lucky for me. When I rang to book a room the lady on the phone was lovely and nothing was to hard. Even told me where I could park the truck. When I got to the room the air con was on and the room was perfect. Thank you so much. Will definitely stay here again. Add promo code “April” for 10% discount on all rooms. Pre Easter sale Valid until 17 April 2019.